Classy Caps solar post caps add radiance and allure. Our caps are available in various styles and sizes to fit over almost any PVC, wood, steel or aluminum posts. 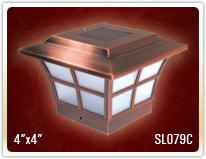 They are ideal for fences, railings, mailbox posts, docks, and walkways- almost anywhere a soft accent light is desired. Classy Caps do more than just beautify, they contribute security and value to your property. Our Ambience post caps have two unique LED's that provide a warm yellow light with the effect of a lit candle. Attractively designed in a Japanese garden style, the Ambience is available in traditional PVC white as well as a rich Copper finish. Dependable performance with unique style. 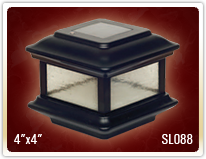 Fabricated from durable cast aluminum the Colonial post cap is designed to fit over 4" x 4" wood posts. The attractive Colonial is complimented by using real pebbled glass panels. 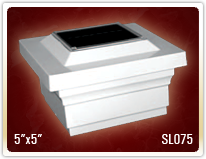 Built to our stringent quality standards it will stay lit for up to 12 hours. The Low Profile Majestic cap casts a brilliant white light down onto the walls of the cap and surrounding area creating a unique ambience. It is available in white or tan PVC and will fit a 5" square post. Our thorough quality control guarantees dependable performance every night. The Prestige post cap is available in traditional white or a rich copper finish in a range of sizes. The Prestige Series will accommodate both PVC and wood posts up to 6" square. Stylish and durable with performance you can depend on. The novel Fairmont Solar Post Cap can be used for post or wall mount. It is Complimented using real pebbled glass Available in black or white. An elegant design, the Regal has 4 LED lights that are strategically positioned so the light cascades down the outside walls of the cap and illuminates the surrounding area. Like any Classy Cap product the Regal is built to last. Available in tan or white. 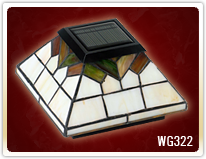 The stylishly graceful Wellington solar post cap will add a distinct charm to your home. It is designed using 4 high output LED's to illuminate the beautiful hand crafted stained glass and surrounding area. 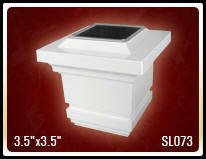 Rugged cast aluminum construction available in white, black or bronze the Imperial offers a clean contemporary design. Powder coated finish means no future painting. 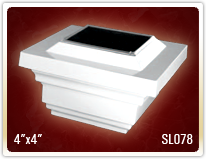 Unequalled in performance, the 4"x4" and 5"x5" Imperial is designed using 3 high output LED's to provide a brilliant white light. 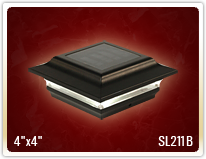 Attractive traditional design our Classy post cap is engineered to provide up to 12 hours of light automatically every night. Fabricated with 4 high output LED's that cast a bright white light downward onto the side walls of the cap, creating a unique ambience. 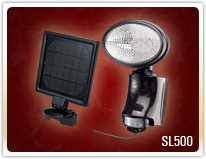 Innovative solar lights designed to create a soft ambience almost anywhere. Installs easily with two screws – no complicated wiring. A great accent for decks, stairways, patios and gardens. 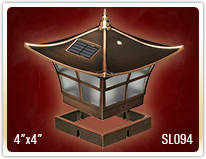 Add unique lighting accents to gardens, patios and lawns. 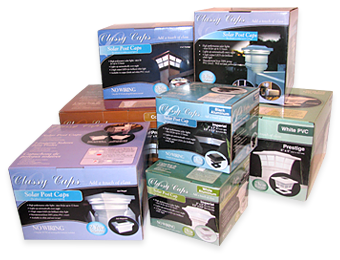 Each kit has 3 high performance spotlights shedding a brilliant white light. 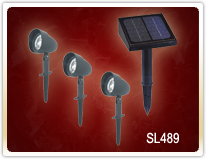 The spotlights come with stakes for ground installation but these lights can also be easily attach to a wall. 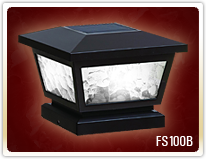 Illuminate the outdoors easily and efficiently. Add safety and beauty to your outdoor gardens and pathways. 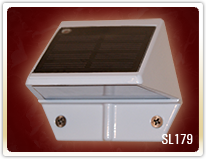 Powerful solar lights provide a brilliant white light over a large radius for up to 10 hours per night. 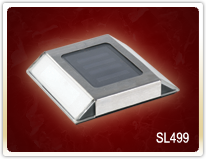 Our path lights are made with durable weather resistant stainless steel. Energy efficient and super easy to install.